A ring ditch of probable Early Bronze Age date was discovered this autumn during archaeological work by the Surrey County Archaeological Unit on behalf of RMC at a gravel quarry on the edge of the medieval village of Thorpe in north west Surrey. The site lies about 1km from the Iron Age hill fort at St Ann's Hill and the M25 and M3 motorways, and is located in an area of the County that has produced a number of sites of major importance, including the Late Bronze Age riverside site at Runnymede Bridge. The ring ditch, which formed a complete circuit c30m in diameter, appears to be all that remains of a round barrow that was probably ploughed away in antiquity. With the loss of the barrow it is not known whether it contained any burials. 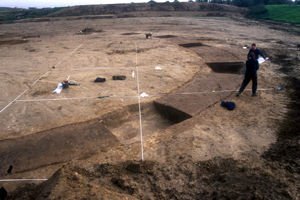 There were, however, two crouched inhumations located within the basal fill of the ditch, lying within metres of each other on the north east side of the barrow, and they are likely to date to the Early Bronze Age. No grave goods accompanied the burials, but the fill of the ring ditch produced a variety of finds including pottery of early to middle Bronze Age date and flintwork dating to Late Neolithic and Bronze Age periods. The site also produced evidence for a Roman field-system, part of which cut across the ring ditch, in addition to a number of Roman and Saxon pits. Post-excavation work is currently in progress.